Ten dissatisfied jobless have attempted a new collective suicide in Rabat by swallowing poison and setting themselves alight. Two members of the group were arrested by the Police on Thursday, reported the partisan French-speaking daily, L'opinion. The Rabat police managed to intervene on time to prevent any deaths. These victims of despair were hospitalized at the city's Ibn Rochd Hospital, four of whom are under intensive care. This is the second suicide attempt by members of the National Independent Group of Unemployed. 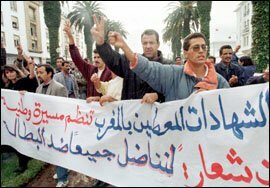 Twenty of its members aged between 25 and 41, attempted on Dec. 15 a collective self-burning while protesting in front of the Ministry of Health in Rabat. Earlier, Azeddine Raouchi, one of the protesters who set himself on fire on Dec. 15, told Morocco Times “the group of unemployed is fed up with the government's false employment promises; that is why they have decided to burn themselves alive so that the government may pay more attention to us, and give us our simple right, which is a job”. The crisis goes back to Oct. 2003 when the group of unemployed started having a series of talks with government officials to solve their problems. After several meetings with the government, dialogue reached a deadlock. Last June, the group managed to have an agreement with the government which stated that half of the jobless members, which includes 48 jobless, be employed at the Ministry of Justice and the other half at the Ministry of Interior. The Ministry of Justice kept its promises and employed 27 people. “However, the Ministry of Interior has ignored the other 20,” said Raouchi. “Considering our miserable situation and the constant meetings without results, demanding only our rights, we have decided to burn ourselves,” he explained. Members of the National Independent Group of the Unemployed had already warned the government that they will burn themselves on Dec. 15 if the officials did not consider their concerns. “We were called for a meeting with the Wali but the discussion has reached a deadlock. So the next day we soaked our clothes in petrol while protesting. The police came in quickly and started hitting us and due to the police treatment and the psychological pressure on us, we have set ourselves on fire,” Raouchi said. Raouchi told Morocco Times earlier that “the group will keep the series of suicide attempts until the government responds to their needs,” and that explains the second attempt.